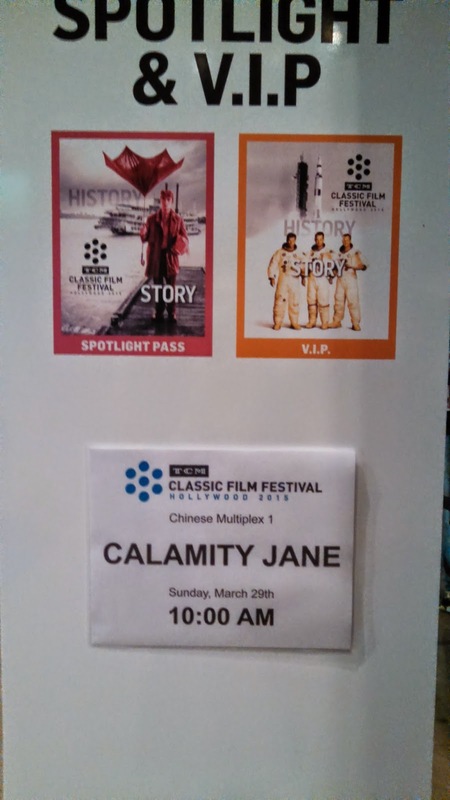 I couldn't think of a better way to start day four of TCMFF than with the rousing opening number of Calamity Jane (1953). Doris Day standing on top of a speeding stagecoach singing at the top of her lungs was quite the eye-opener. Though I knew it was ridiculous, there was a part of me that hoped right up until the screening began that Day would make a surprise appearance. I don't think there's any way TCM would handle such a sought after, high profile guest in that way, but I can dream. My original plan had been to see Psycho (1960) next, but that seemed too jarring a change in mood. I decided to go with the TBA screening of Reign of Terror aka The Black Book (1949), figuring that if it was so popular the first time, it had to be worth seeing. The always nattily dressed Noir czar Eddie Mueller introduced the screening. Though I was a bit disappointed that Norman Lloyd would not be there to chat after the screening as with the first showing, Mueller provided interesting background on the film. He said that it was made on a low budget, partly so the expensive sets from Joan of Arc could be used again. This tidbit helped me to appreciate the artistry of the film, because while you can see how the filmmakers cut corners, the production never feels cheap. Set during the French Revolution, Robert Cummings, Richard Basehart and Arlene Dahl star as the most Hollywood French people you'll ever meet. I didn't know that any of them were in the film, nor Beulah Bondi or Charles McGraw. I felt a little jolt of excitement with each new revelation in the credits. When I realized Anthony Mann was the director and John Alton cinematographer, I cheered! I also quickly understood why this was considered a noir film, as this pair knows a thing or two about shadowy doom. I loved going into this movie knowing nothing and appreciating every surprise it held for me. The lower budget actually helped the film, because Mann would just shoot a little tighter, Alton would set the lights a little lower and the shadows longer, and between the two of them, they created a marvelous sense of dread. While it seems to be only available in rather ragged prints, I highly recommend searching this one out. While The Philadelphia Story (1940) has never been a particular favorite of mine, I've always found it to be aglow with the kind of magic that first drew me to classic films. The story doesn't appeal to me, but the cast is amazing: Katharine Hepburn, Cary Grant, Jimmy Stewart, Virginia Weidler, Roland Young and Ruth Hussey among them. It's not so shabby that George Cukor was at the helm as director as well. As I expected, I enjoyed the film more with an audience, but at the same time, I was starting to wonder how I was going to make it through another film. As soon as the film ended, it was back in line again for Marriage, Italian Style (1964) with an introduction by Sophia Loren. I had been anticipating this moment the entire festival. It was a wonderful experience walking by the already lengthy line queued up for the Chinese Theater. So many friends, old and new, waited to be a part of this marvelous moment too. As we took our spot at the end, many more passed by. It began to hit me that the end was near and I would soon be communicating with these people solely online again. But what a great finale it was! Ben Mankiewicz began the event by reading a message from Robert Osborne, in which he praised the festival staff and said that he was on the mend. That was enormously comforting to hear. Then Sophia Loren was announced, and just seeing her stride across the theater to her chair was a thrill. It was no mystery to anyone in the room why this woman was one of the biggest stars in the world. Mankiewicz was clearly in awe, as were we all. Though I tend to love movies that pair Loren and Marcello Mastroianni, this one was not one of my favorites. It was beautifully filmed and acted, but the story depressed me. Loren suffers so much as the longtime-mistress of a caddish bakery owner. I couldn't stand to see her that way after such a happy appearance from her in person! I will probably need to revisit this film another time. Just like that, it was time for the Closing Night Party at Club TCM. As I walked with my friends down crowded Hollywood Boulevard, I savored the moment. I was tired, hungry, and glad I didn't have another film to see that day, but also a bit emotional. It was great fun to see everyone gathered in Club TCM. I said goodbye to friends and was delighted to meet many more film fans, even during the last few hours of the festival. I enjoyed a glass of Bogart gin courtesy of TCM, but realized that that single drink was making me tipsy because I'd mostly subsisted on a large bag of popcorn that day. Good thing my hotel was only a block away. When the lights went up in Club TCM, a gentle reminder the party was over, I was reluctant to go. Every hug goodbye included a promise to return the next year. With TCMFF 2015 barely in our rearview, we were already planning for 2016.